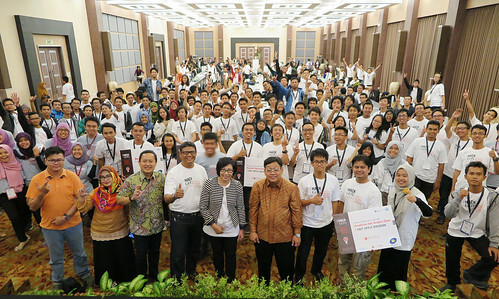 In late November more than 250 people participated in a seminar and innovation challenge under the theme #HackGov: Empowering Indonesia. The Ministry of National Planning and Development (Bappenas), together with the UN Global Pulse in Jakarta, collaborated with Gadjah Mada University, Microsoft Indonesia and XL Axiata to blend approaches from the tech start-up scene with public policy challenges. - Dr. Ir. Rr. Endah Murniningtyas, M.Sc., Deputy of Maritime and Natural Resource, Bappenas. 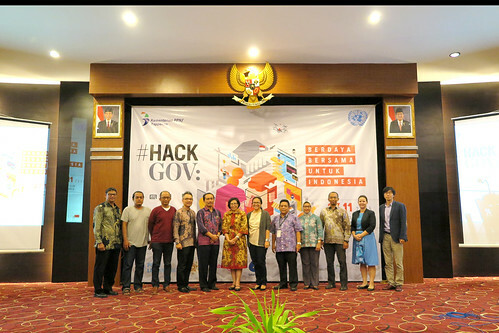 A pre-hackathon seminar was held on 27th November 2015 focussing on how every aspect of society can support the realisation of the Sustainable Development Goals (SDGs) in Indonesia and the need for an adequate system of monitoring. By creating a lively forum for various stakeholders from academia, local governments, private sector, and NGOs, #HackGov built awareness of the benefits of data-driven innovations for frontline public service delivery and better impact tracking. Pulse Lab Jakarta also shared methodologies to measure development indicators through new forms of digital data, as complements to existing statistics. Paradigm change for public service delivery must touch upon digital transformation. Speakers from Microsoft Indonesia, Twitter Indonesia, IBM and Urban Poor Consortium highlighted the applications of technology for social development and XL Axiata’s dedicated internet service for women stated that, with internet penetration at one third of the population, Indonesia has additional challenges to achieve gender parity in internet access and to use the full potential of the internet as an empowerment tool. One-hundred and ninety participants joined the hackthon on 28th and 29th November 2015. The hackathon is already a familiar concept among techies in Indonesia, but #HackGov brought something new to the table. Building from the idea that technology-driven social change needs teamwork, this innovation challenge combined the brilliant minds of programmers, designers, and social planners from different parts of Indonesia. The participants formed into 58 groups and created innovative applications based on municipal data. At the end of the 24-hour hackathon, completed projects were submitted and several winners were annonced. In the category of Data Analysis and Visualisation for the SDGs, the Simpleo team won by visualising the correlation between birth mortality in Indonesia with factors such as poverty levels. The Drops application, developed by Circustudio team, swept the first place award for the Capturing Societal Aspirations category. This application bridges the concerns of citizens with the agenda of public servants on water access and contamination issues. The last category which focused on the Acceleration of Women’s Role in Technology and Social Innovation for Women’s Empowerment was the most popular among the participants resulting in many submissions. The winner, Nusantara Berdaya team created IstriBijak (‘wise wife’ in English), a family financial management service, by processing the expense records and salary allocation to better organise the household finances. Additional special awards were given under the categories of Best Design and Best Concept. Best Design was awarded to Devover team who created the Emak application for better investment in women-driven industries and Womanesia team won the Best Concept category for the NoViolence application. NoViolence covers the powerful topic of harassment and aims to empower harassment victims to make use of the internet’s potential. #HackGov has produced many prototypes filled with great potential for both government and citizens in tracking development, providing feedback, and effectively processing data in accordance with the national development priorities in Indonesia.